Joseph Harbison’s research and clinical interests are around stroke and cerebrovascular disease. His main focus is on the causes and associations of ischaemic disease and stroke in cerebral white matter, particularly how this may be affected by abnormalities of cerebral perfusion. He is also interested in the causes of cognitive impairment, fatigue, and psychological distress in people with stroke, as well as sleep disorders and atrial fibrillation. His research has been published in numerous journals, including the Lancet, Neurology, and Stroke. Harbison has a background in geriatrics, clinical pharmacology, and medical safety. 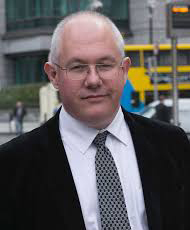 He was chair of the National Advisory Committee on Medication Safety until 2103, and he has participated in Health Technology Assessment projects for the Health Information and Quality Authority in Ireland. He teaches both undergraduate and post-graduate students at Trinity College Dublin and is course director of the Diploma in Cerebrovascular Diseases and Stroke of the Royal College of Physicians of Ireland. He is a fellow of the Royal Colleges of Physicians of London and Ireland and a fellow of the European Stroke Organisation. Harbison contributes to the lecturing and didactic teaching at GBHI and is available as a mentor for Fellows. Bio: Joseph Harbison was initially trained in Dublin and received his higher specialist training in North East England. He worked as a consultant physician and senior lecturer in Yorkshire before coming to Trinity College Dublin in 2006. Between 2009 and 2017, he served as the National Clinical Lead for Stroke in Ireland. He is the current head of discipline in Medical Gerontology at TCD and head of the Stroke Service at St James’s Hospital, Dublin.